At the Metropolitan Museum in New York, the roof has become a rain forest, overlooking the soft green woods of Central Park. Nestling on among the concrete and brick of the fourth floor courtyard, bamboo poles crowd and cluster, forming a sort of stilted cocktail party, alive with anticipation. 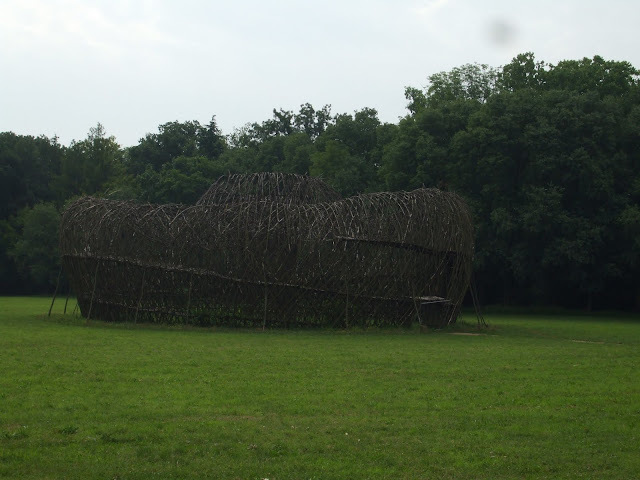 This is Big Bambu. 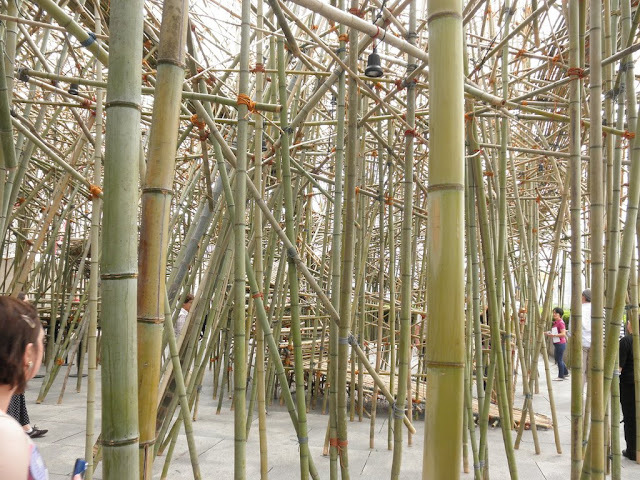 At floor level, it's a labyrinth of slim pillars, but look up a little, and Big Bambu becomes a bird's nest, full of complicated, chaotic intersections. There is no symmetry in the tangle of poles, but somehow the eye finds patterns, geometric harmonies in 3D. Doug and Mike, the Starn twins, support and direct the overall look of the sculpture, which started as an idea some 13 years ago. 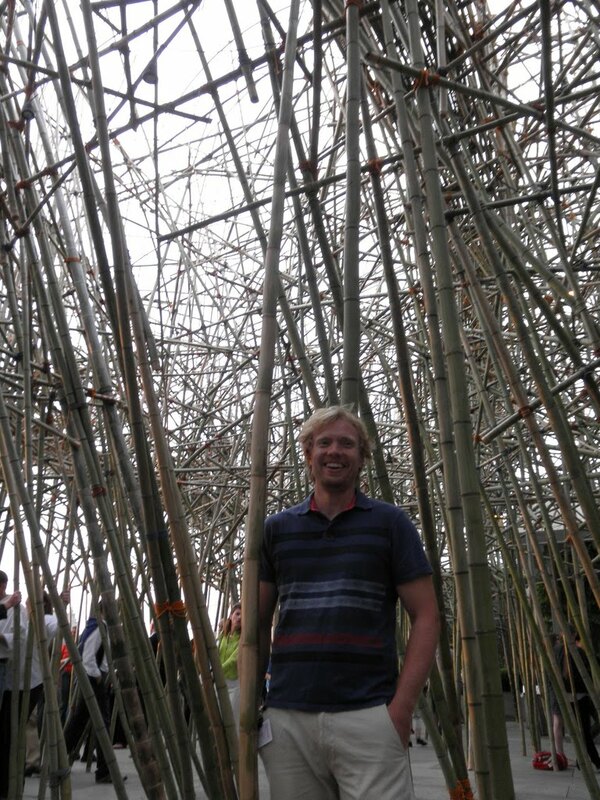 Previous to getting permmission to nestify the Met, they built an incredible indoor bamboo arch at their studio at Beacon, just to show the possibilities of both the materials and the techniques they had in mind. 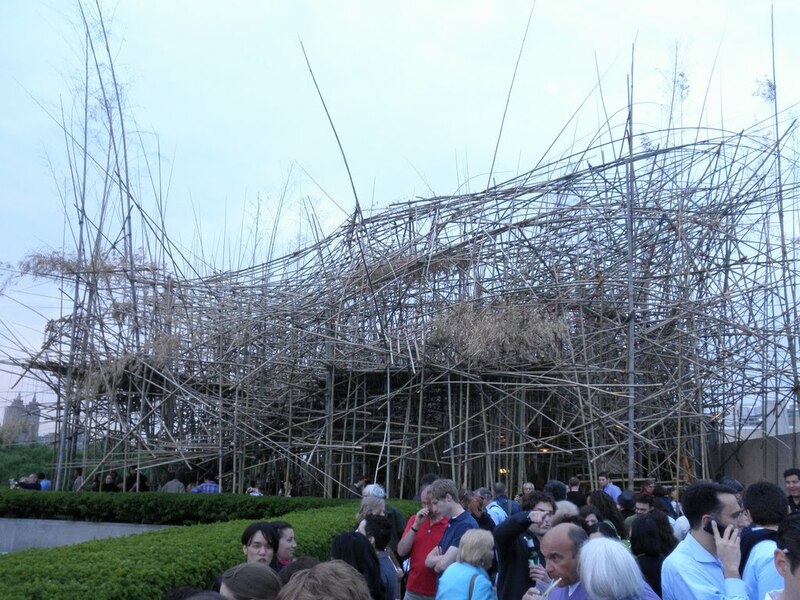 The interior pathway made and reminded me of the voliera in Parco di Monza, but while that structure from 2006 is showing signs of decay, Big Bambu is the Voliera taken flight; bright, busy and still growing: how apt Big Bambu's tagline You Can't, You Won't You Don't Stop. But with typically light touch, Doug and Mike have not micromanaged their builders, who are mountain climbers, not professional scaffolders or artists. The brothers set goals to reach, marked on the ground, and then the guys branch out, knot by knot, pole by pole, to reach them. This is performance art: every move has to be calculated, small engineering quandaries must be overcome, either in private moments of calculation, or with the help of the rest of the team. 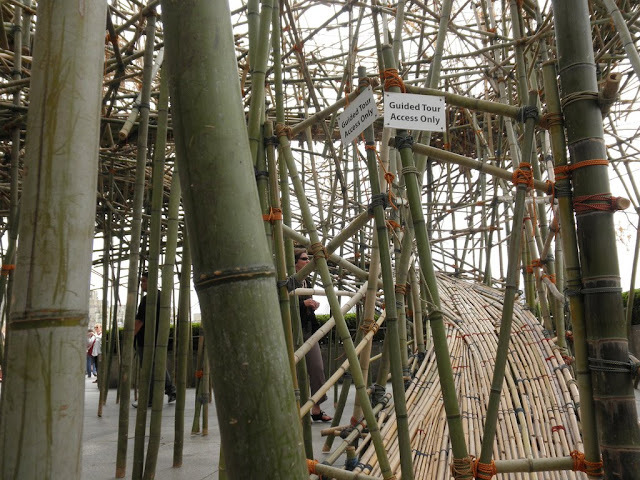 The result is a unique knitting together of individual solutions to the shared problem of how to get there from here... Big Bambu is an allegory of the city that surrounds it, already complete but never finished, worked out in flows and currents that you have to be inside to really appreciate. Bamboo is used in the Far East for scaffolding, and it's resilient, light, flexible and forgiving. The dozen or so helpers who work each week on the Starn's project were chosen for their ability with 'methodical knots' (each brightly colored, Swiss-made 'bootstrap' takes about three minutes to tie just right) and with a head for heights. Both talents are essential: the structure is currently 20 feet tall but will soon tower some 40 to 50 feet above the rooftop. Most visitors only get the roof-level effect of the build, many don't even notice the winding paths that run up into the sky, and the gaping hole at the center, but for a lucky few, there's a chance to climb up into the structure and to do so just before sunset is the best. During the summer, on Friday and Saturday nights, the roof of the Met is open until sunset, and fills with visitors enjoying a cocktail, company, and the view. So far, thousands of strings, and more than 4000 poles of varying sizes have been gradually hauled up onto the roof for use on the structure: 'We're rocking the domestic bamboo,' Zac said, 'All of it comes from South Carolina and Georgia.' With the exception of sensible things like making the walkway complete and safe for visitors, they try to build in such a way that it is not necessary to cut the poles down to size; they'd rather work with the dimensions and use them to invent and suggest new departures for the construction. 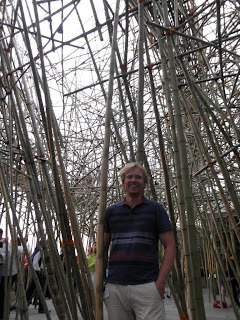 It's not until you climb inside the structure, however, that you really get the feel for it. Groups of 15 (the number of people who can be transported in a single elevator from the ticket office in the basement up to the 4th floor) are let in through the bamboo gates and up the narrow walkway. Like corpuscles moving through an artery inside a great beast, our feet and hands interact slightly nervously with the springy interior. 'It's not often an artwork can make you a little afraid,' Zac comments. This is New York, the whole thing has been subjected to all kinds of safety tests, but the feeling of being on the edge remains. You can't carry a camera - or anything else you might drop on the visitors below - up into the sculpture, so no pictures, sadly, but it would be impossible to capture the sensation of being a part of this build, connecting with each beam, with each builder, and in a new way with the city at out feet.